We admire masterworks in museums for, among other things, their brilliant colouring, their longevity due to the painter's technical expertise and for the evidence of the artist's hand in the brushwork. Many paint effects from the past seem nearly unattainable with modern materials and this has lead artists to try to rediscover secret formulas or find additives that emulate historical processes. Resins, wax, and complex chemical mixtures have all been tried. Research done by the National Gallery in London however has revealed that linseed oil, coloured pigment and additions of calcium carbonate are the sole ingredients in many master works before the 20th century. My involvement in this exciting investigation began when I assigned Velazquez, the 17th century painter, as the topic of my advanced painters seminar. We looked into the addition of marble dust, a form of calcium carbonate, to his paint. I stumbled on the information about hand refining oils then but felt it was too intensive to delve into at the time. It took me several more years and further seminars on Rubens and Rembrandt before I took the plunge and followed procedures I had read about online. The results are quite amazing to me, the difference from the handling of modern tube oils is significant. 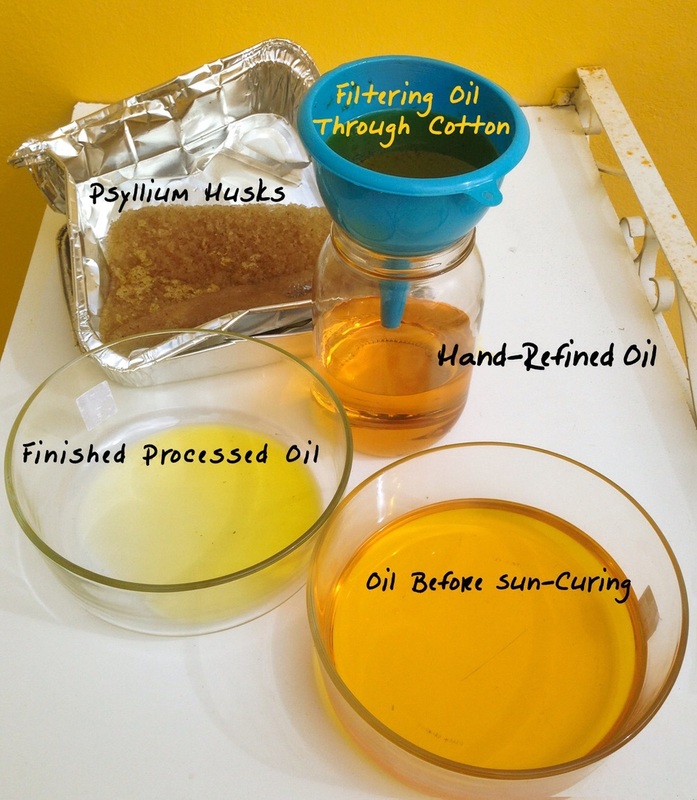 The hand refined oil makes many things possible which I had read about and seen but had not been able to obtain. I always felt tube oils were too slippery, too thin, too flat once dry. I also found the suede effect annoying and could not build up impasto areas without needing many days of drying time. The hand refined oil has none of these defects. 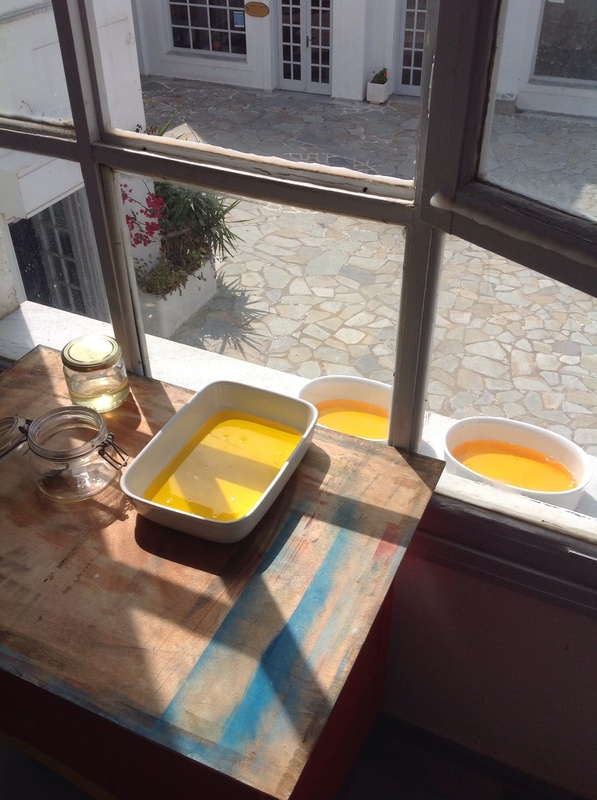 This semester I introduced the new oil to students and we worked together to understand its potential. It is more flexible, shinier and forms a tougher film than the tube oils. The viscosity of the paint allows one to paint wet into wet without loosing brushstroke integrity and colour purity. It is far more transparent, the glazes are deep and clean, it dries evenly and quickly and doesn't seem to darken as much. Impasto areas can dry overnight, depending on the weather, and keep their sharp edges and texture. The best part of all of this is that solvent has been banished from the studio. We clean our brushes in vegetable oil and never thin paint with solvent. The smell of the new oil is something like fresh grass or fields of flowers. Because we mix it 1:3 with chalk and then use that 2:1 with tube paint our paint supply goes much further. It is hard on brushes though, they wear down quickly. One wonderful advantage is the ability to wipe off the paint completely from a dry underlayer making changes in plan easy to execute. Rembrandt: "The Late Works". Some thoughts on visiting the exhibition with two poets and a photographer. Knowing the exhibition would be crowded we organised our tickets for the last two hours of the day. Even so the smallness of the rooms and the number of people jammed into them did not make for comfortable viewing. A similar crush occurred during the Da Vinci show. It's time the National Gallery allocated a bigger space for its major shows. The first room of the exhibition held four self portraits from the last ten years of Rembrandt's life. Entering from the grey damp London weather directly into the vivid charcoal reds and resinous blacks of the paintings we experienced a quick intake of breath. The powerful self portraits each capture a memento of passing time on his face and form, his flesh more grey, his eyes growing more opaque with the years. Those who know any of the other nearly one hundred self portraits can see his loss of energy, humour and confidence. We believe the paintings to reflect the veracity of his physiognomy and yet we are not looking for attributes that would identify him. We feel he is revealing his inner depth. Knowing that he died bankrupt having turned away from the lucrative commissions which would have kept him in the public eye, suffering the death of lover and children, we feel we are witnessing his sorrowful soul. The exhibition continues with a journey into the oeuvre of the great Rembrandt as he experimented and pushed his technical skill to express his tender view of humanity. The paint itself captured us as it pulsed and swirled, thin as silk one moment and heavy with turbid weight the next. The transparent darks pushed back into unspecified backdrops while the lead white clumped or embroidered the edge of collars or highlights on nose and eyelid. We were particularly taken by these warm and textured whites. They were a character of their own, playing a part as varied and eloquent as a Shakespearian actor. Rembrandt placed the white with palpable energy, using a stick, a brush, perhaps a rag. It hovered under glazes and emerged like waves breaking. His limited palette, with little or no blues and limited earth greens did not keep him from expressing nature while his concentration on capturing faces was best served with the "tetrachromy" of the Ancient Greeks: white, black, yellow and red. A portrait of Lucretia whose blood leaves her white gown stained red, trembles with sadness and dishonour as she plunges the knife into her side. Perhaps it is a tribute to his mistress, Hendrickje, who was hounded by society to confess her sin of living out of wedlock with Rembrandt. The subject from Roman history expresses a woman's deeply conflicted emotion. The emotion is the theme again with the magnificent painting of Bathsheba as she contemplates the letter from David, her King. The somewhat damaged surface of this work does not distract from the subtle current of anguish she expresses. There are many etchings and drawings interspersed with the paintings in this exhibition. 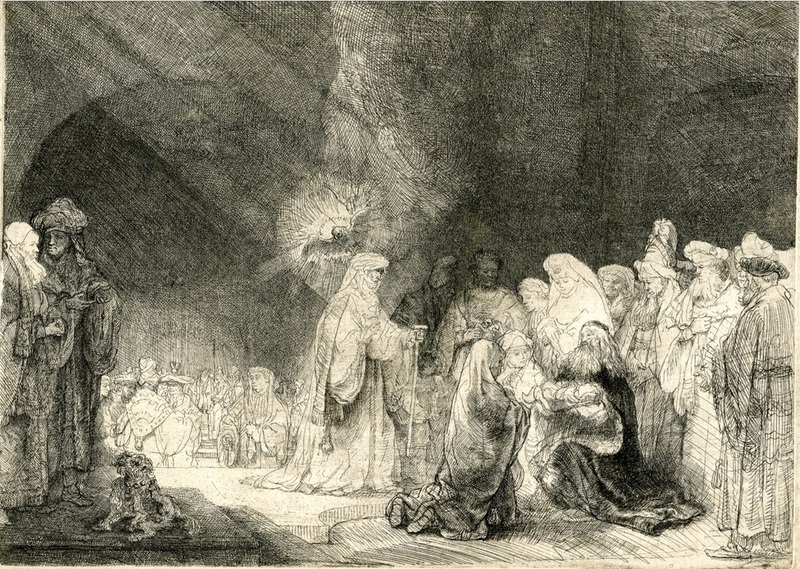 Rembrandt's etchings are a miraculous tangle of haunting lines. With bravado and verve he depicts so much information with so little effort. These pieces greatly added to our understanding of his vision and method. The vivacious brushwork is equivalent to the handling of the etching needle, the supremacy of white is equal to the vibrant unmarked white of the paper. Light is the subject and everything else falls to its authority. We see his thought process more clearly in the etchings but the large textural paintings dominated the show. According to a very comprehensive color charted provided by Clorford.com (a trusted resource on color swatches) grey and gray are actually two different "color swatches". According to a survey conducted both in the U.S. and England, many people believe grey is an actual color perceived as the hue of "silver", and gray is a sliding scale of values from black to white. It also included this helpful mnemonic device: that grAy is used in America and that grEy is generally used in England. My computer, which uses British spelling by preference of my family members with close association to England, always shows "gray" as a misspelling. Seeing these terms associated with separate colours was new to me. Recently I have come to a new respect for grey working with the camera obscura which reduces chroma and brings neutrality into the image. The human eye is very sensitive to nuances of temperature; a warm grey and a cool grey are easily distinguished even if they are identical in tone. Unfortunately the film camera is not so sensitive and rendered all my greys identically thereby making my photographed work look quite dull. I was taught not to mix colour with black pigment, a remnant of the Impressionist era when new bright colours were being manufactured and the prismatic palette was used by the majority of painters. 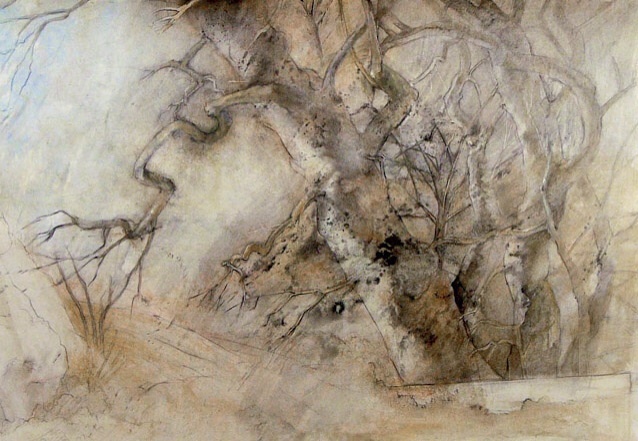 My investigations into techniques of past masters led me to use black as part of the earth palette and as a glazing pigment. Black is used in place of blue in the simple four colour palette (yellow ochre, red oxide, white and black) as well as a way to bring down the intensity of the warm colours. Mixing with grey paint is a commonly used strategy for reducing chroma without changing value; when applied to high chroma paints some adjustment is needed to counter the small darkening that occurs. Mixing with grey is commonly also accompanied by a shift in hue, generally in the same direction as that seen in mixing with white paint. These shifts are accentuated if the grey is somewhat bluish, as results from mixing most black paints with white. A perfectly neutral grey (made for example using raw umber plus a black as the darkener) will eliminate this latter component of the shifts, but not the hue shifts that are due to the undertones of the coloured paints. Using a grey to reduce chroma is an important tool that keeps the painter in control of the value of the mixture, whereas the traditional recipe of mixing with the complementary tends to surrender control of the value to the paint. I have been making a tonal scale of neutral greys and mixing them with my colour. If you need a neutral yellow and a neutral pink for instance to sit side by side in a visual plane this is easily accomplished by mixing them with the same value of grey to bring them into close approximation. Mixing them with their complementary colour means darkening the yellow with purple and bringing the red toward brown with green. It is much less efficient than simply mixing with grey.